It seems inevitable that in any given Fringe there will be at least one play regarding, inspired by, or including alcohol. 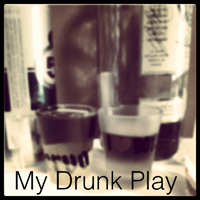 janovision Productions’ My Drunk Play, continues this tradition as part of the 2012 Toronto Fringe including a headline that reads: ‘It could be funny. It could be embarrassing. It could be terrible.’ Unfortunately, after seeing this show opening night, I left feeling the latter rather than the former. The show consists predominantly of a series of monologues, most of which are delivered directly to the audience on their own, while others are intercut together. This was possibly the one redeeming quality of the piece as the first person testimonials, gathered by writer Jane Van Rooyen who also directed and acted in the piece, accurately reflected the often unglamorous, yet humorous, consequences of having one too many. While the show felt, to me, seriously under rehearsed – I lost count of the number of line flubs and missed cues after the 3rd or 4th scene – its message was nonetheless clear: We all do stupid things when we drink too much. While mostly concerned with our memories of the night before (or lack thereof), the play gets caught in a cycle where the boys feel bad, then laugh it off with bravado; while the girls feel bad, and mostly promise not to do it again. While I watched the play, I kept thinking back to an observation someone I knew once made about drunks, the essence of which was in nearly every situation: Drunks will do their best not to show that they are, in fact, inebriated. Maybe it was opening night nerves, or the density of the text, but the actors seemed to rush through all their lines, trying to prove they weren’t ashamed or embarrassed by them. The result instead seemed to me as if they didn’t care enough about the stories they were telling to spend the time needed on them, and so I didn’t end up caring for them either. I felt bad for the sparse turnout this show had for its opening (made all the more obvious by the ample seating at the Tarragon Theatre) and which made the room echo with the occasional lone laugh the actors were able to get. Following the play I ran into a fellow audience member, in the men’s washroom of all places, who asked if I had just seen the show. Answering yes, and confirming he had too, I asked what he thought and was quite surprised to hear he loved it. It was his first Fringe show ever, and from the smile on his face, and excitement in his voice, I could tell it wouldn’t be his last. Given the innate awkwardness of conversations had over bathroom sinks though, I didn’t press him further on the subject. So there you are: two people, same play, two completely different reactions. I’ve explained why I felt the way I did, but if you’re curious as to why he felt his, you can find the details for the show below.